Two years after the raids at the Asia Art Week in New York that rocked the industry in 2016, the fair that lasts for 10 days witnessed another successful edition of its business. Annual editions of the Art week attracts top Asian art dealers, numerous auction houses and prospective buyers who have an eye for appreciating beautiful works of art. The much-celebrated affair, however, has a dark past and a history of its participants associating themselves with international smugglers and people with a more than dubious reputation. In 2016, after confiscation of properties by the Homeland Security, sales at the festival dropped to $130 million from $360 million the previous year. 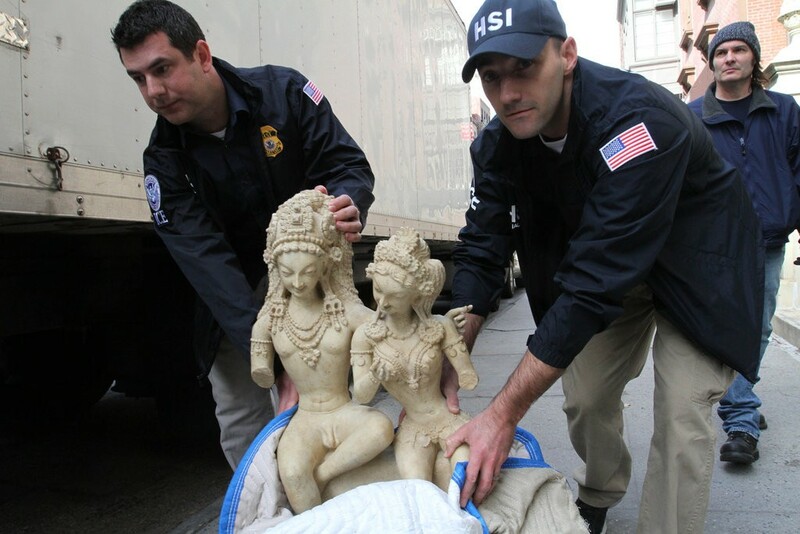 Homeland Security confiscated two items from Christie’s, one of the vendors, who had included the items under an auction titled, “The Lahiri Collection: Indian and Himalayan Art, Ancient and Modern.” Christie’s has also been linked to Subhash Kapoor, a notorious arts smuggler, who has been in Indian jails since 2012. But despite the confiscations and the link to a smuggler, Christie’s appears to have participated in 2018 as well. Dedicated galleries of Indian artefacts can be still found on the websites of these vendors. 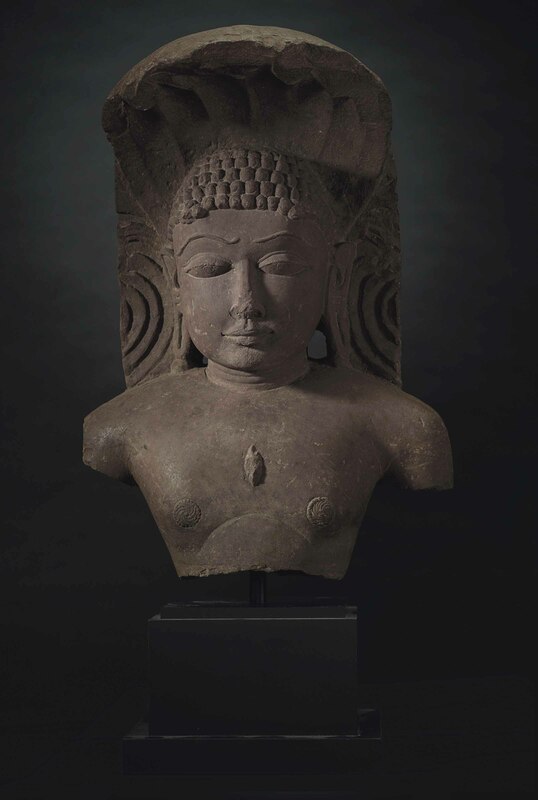 Most are clubbed under galleries titled ‘Indian, Himalayan and Southeast Asian works of Art.’ There is no indication that these artefacts are illegally or unethically occupied. 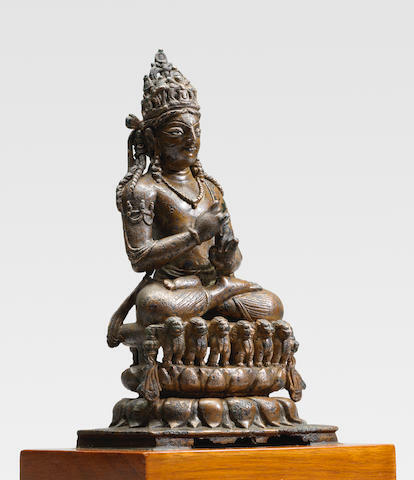 The Catalogue Note for the this idol asserts that the sculpture “epitomizes the qualities of Newar master artists working for Tibetan patrons in the fourteenth century.” Buddha Shakyamuni can be seen in the idol with his hands in a gesture of turning the Buddhist Wheel of Law and expounding Dharma. In Buddhism, Vairocana is seen as the embodiment of the Buddhist concept of emptiness and is considered a primordial Buddha. Vairocana is especially revered in Western Himalayan cultures. 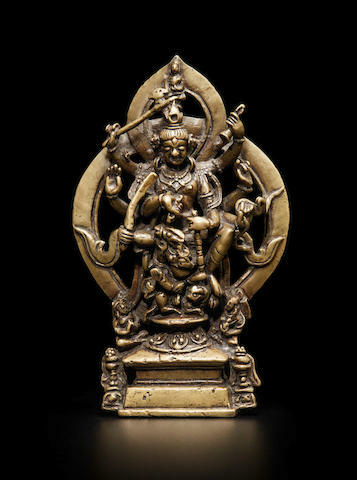 The idol below is described thus, “The present sculpture is outstanding for the size and completeness of its composition. The casting’s finer details are preserved in the delicate modelling of the thin scarf across Vairocana’s arms, and the rich spiralling tresses framing his broad shoulders. Armbands high on the biceps show three prominent jewels above chained swags. 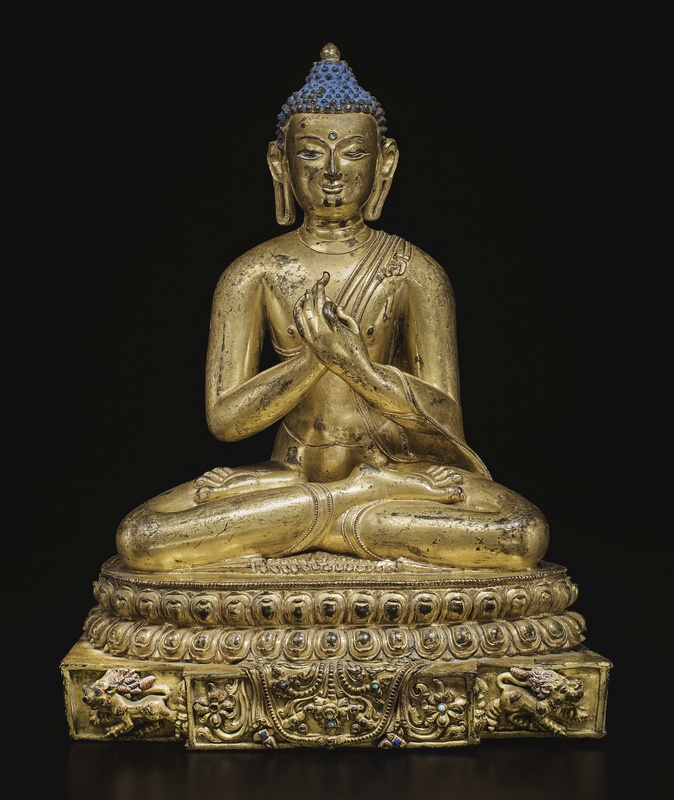 Vairocana’s plump cheeks and penetrating inset silver eyes complete the remarkable figure. Parshavanatha is the 23rd of the 24 Tirthankaras of Jainism. He is the earliest Jain Tirthankara regarded by historians as a historical figure. Jain sources place his existence between the 9th and 8th century BC while historians assert he may have existed between 8th and 7th century BC. Parshavanatha is among the Tirthankaras most revered by the Jains and he is easily distinguishable with the serpent hood over his head. 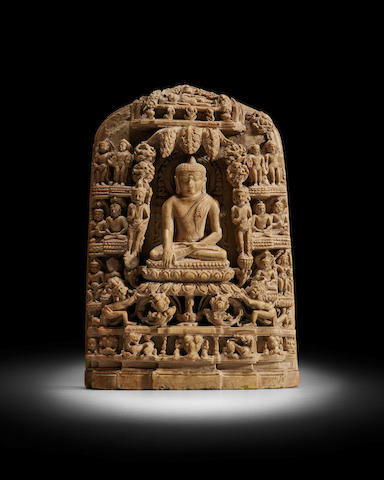 The idol above is described thus, “Portable, intricately carved, and packed with stories about the life of Buddha, this particularly fine pyrophyllite stone plaque belongs to a small group that occupies a pivotal place within Buddhist art history and the spread of Buddhism throughout Asia. Originally carved during the Pala period in Northeast India (8th-12th centuries), these plaques have been discovered in remote repositories as far as Tibet, Myanmar, and Sri Lanka; some bearing inscriptions just as varied, including Newari, Tibetan, and Chinese”. A phenomenon that has been observed by law enforcement authorities is the fact that those legally trading in artefacts often have no clue that they have bought a smuggled product or simply do not care if their product has been acquired by the seller through dubious means. However, there is sufficient reason to believe that terrorist organizations are behind a lot of the smuggling. The United Nations passed a resolution recently which stated that terrorist organizations such as the ISIS and Al Qaeda have been generating revenue by trading in smuggled antiquities from Iraq and Syria. It noted with concern “that ISIL, ANF and other individuals, groups, undertakings and entities associated with Al-Qaida, are generating income from engaging directly or indirectly in the looting and smuggling of cultural heritage items from archaeological sites, museums, libraries, archives, and other sites in Iraq and Syria, which is being used to support their recruitment efforts and strengthen their operational capability to organize and carry out terrorist attacks”. The extent of the menace can be gauged from the fact that in 2016, close to 300 ancient stone and bronze idols, wooden artefacts and paintings worth hundreds of crores had been recovered by the Police from a single man. Between 2010-2014, there were 3000 unsolved cases of stolen cultural property. The problem is augmented by the fact that there are hundreds and thousands of ancient monuments in India that do not have proper security making them vulnerable to thievery. It’s estimated that 10,000 artefacts were stolen in the period between 2010-2016. Even as the Directorate of Revenue Intelligence compiled a list of artefacts seized, it asserted that India’s rich cultural heritage was under threat from international smuggling syndicates which are targeting ancient Temples in the country and various archaeological sites. Smugglers often specifically target poorly guarded Temples for their purpose. Prime Minister of Modi is the first Indian head of government to demand stolen Indian heritage from the U.S, Canada, Germany and other countries. The USA handed over 200 ancient artefacts to Prime Minister Narendra Modi during his visit to the States but only 11 have come back to India thus far. However, the new Antiquities Bill proposed by his government in 2017 appears rather weak when compared to global standards. 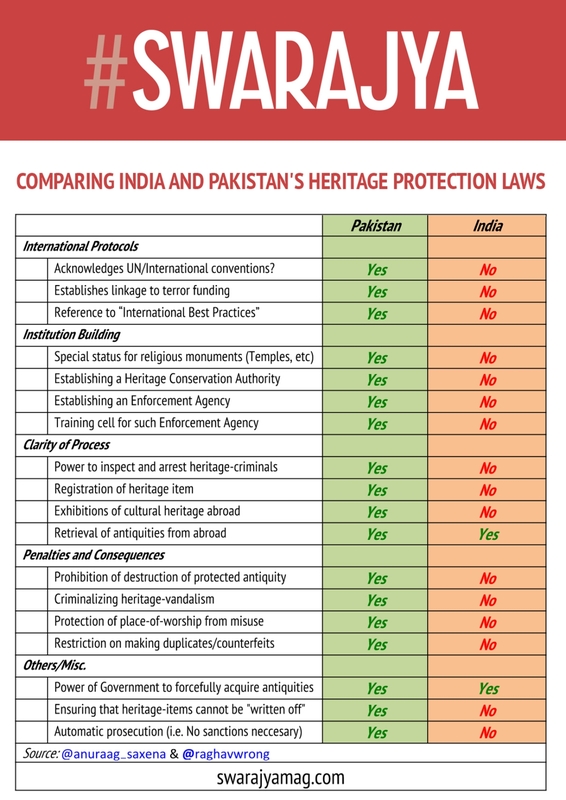 Swarajya did a comparison of India’s Antiquities Bill 2017 and Pakistan’s KP Antiquities Bill 2016 and discovered that India’s proposed antiquity law pales in front of the latter. The Archaeological Survey of India (ASI) tasked with the job of preservation and maintenance of cultural monuments and antiquities has been thoroughly incompetent at performing the duty it has been assigned. In 2013, the CAG slammed the ASI for neglect of world heritage sites and stated that the ASI does not even have a database of all the antiquities in its possession. Not only antiquities, even monuments go missing under the watchful eyes of the ASI. Even Temple administration and political leaders are responsible for missing antiquities at times. Recently, a Congress student wing leader in Karnataka was arrested for stealing and attempting to sell antiquated idols of Jain Tirthankaras. In December last year, Ramjanaki Temple in Uttar Pradesh had been stolen of priceless Ashtadhatu idols of Lord Ram, Sita and Laxman. Interpol has a dedicated database for art-related crimes. However, India neither contributes nor makes use of it. Anuraag Saxena, a volunteer with India Pride Project, an organization that works towards tracking and reinstating India’s stolen-heritage, has been following the loss of India’s antiquities for a while. He rues the lack of constructive efforts by Indians towards recovering their ancient artefacts. He says, “When American symbols are attacked (like 9/11 attack on WTC), they hit back with all their might. When Indian symbols are attacked, we go and whine on Twitter.” He goes on to add, “Pandit Deendayal Upadhyay ji once said, ‘The basic cause of the problems facing Bharat is the neglect of Its National Identity’. Symbols of this identity are being destroyed right before our eyes.” He doesn’t mince his words against these auction houses as well. “I have one question for these auction houses – “How can you proudly sell what your grandfather stole from mine?” However, some have even tried to communalize the efforts at retrieving India’s lost artefacts by the government of India. It’s time that we regard theft of Antiquities not merely as a cultural theft, which is a huge issue in itself, but also a civilizational threat and a threat to the very existence of our nation. Because it has become clear, and even the United Nations agrees with it, that terrorist organizations are funding their nefarious activities by trading in smuggled cultural artefacts. It is ironical perhaps and quite troubling that terrorist networks are using the cultural heritage of a people to wage war against their very cultural identity. And on a deeper level, we owe it to our ancestors that we return the memories of their tradition and their endeavours to those who would truly treasure them and worship them and not abandon them in the hands of those who would treat them as merely decorative pieces. The stolen items, however, are yet to be recovered, says crime branch of the Guwahati Police.